When posting to Facebook or Twitter, it can help to add an image. These images make the post stand out and get more people to visit your website or contact you. You can simply do a background colour with some text, or add text to an image by using the image as a background. This is also useful if you want to share more than 140 characters in one tweet. 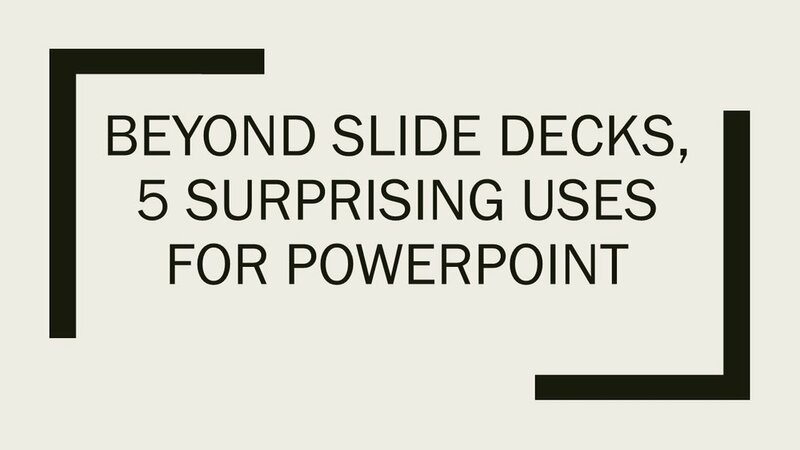 When you save the slide, you can save it as a JPEG file. To make a quick sign, just use the title slide. You can add text and insert shapes like arrows above. Sometimes you need to make a diagram to explain something. Mind maps and flowcharts can be useful. In the Home ribbon in PowerPoint in the drawing section you can add shapes. Just click on the shapes to add text to them. You can resize the shapes and change the background colour and text colour. You can also add arrows between the shapes. If you save the file as a .pptx file as well as a JPEG, you can share the JPEG on social or add it to documents, but you can go back to the .pptx file and change the text and arrangement for later. While making a finished website is beyond PowerPoint, you can design a rough outline of what your site will look like. This can be useful to get the ball rolling with a designer, or to discuss options internally. If you insert a link in a slide, you can have the destination as another slide. This feature can make the presentation behave a bit like a website. You can also design an app or a piece of software in the same way. It can be embarrassing sending the wrong email, but sometimes you can recall it. We outline your options below. If both parties use Outlook, then recalling or recalling and replacing is possible, once the receiver hasn’t opened the email. To recall the email, first go to the sent folder and open the email you want to unsend. In the Message ribbon, on the right in the more box, click the actions drop-down menu and click Recall message. - “Delete Unread copies and replace with a new message ” will let you send a replacement message. Important. These will only work if the message is unread and if the person who got the message uses Outlook. When you send a request, you will get an email saying it was successful or not. If the receiver uses a different email client, there is not a lot you can do. The Recall option will send them an email saying the sender has asked for the email to be recalled, but the wrongly sent email will still be in their inbox. Bytek can help with this and other IT needs for small and medium businesses. For a quote of expert advice, Contact Us Today! There are two slightly different ways to do this and they are outlined below. Then just enter your username and password and it’s done. If you don’t have Office 365 don’t worry, you can still get you exchange email on your iPHoneHowever, we do recommend moving to Office 365, as it is a great service.